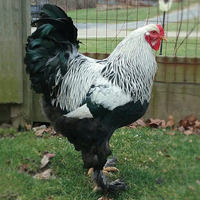 Buff Brahma chickens are very large and have the same quiet temperament of other Brahma varieties, but are still very rare. 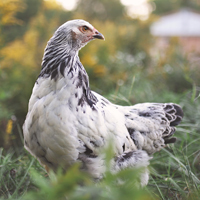 Light Brahmas are large, white-feathered chickens with black hackle feathers tipped in white, black tail feathers and heavily feathered shanks and toes. 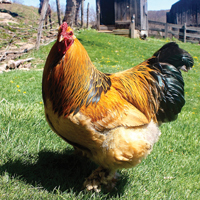 These easy-to-raise chickens are cold-weather hardy, and have a quiet temperament. Dark Brahmas are large, gentle chickens. Roosters have striking silvery white and black feathers, and hens are a beautiful silver-penciled steel gray.